To the uninitiated, the doomsday music, actors on horses, and free-flowing blood feel like a movie-scene massacre. In 680 CE, one man led an army to battle for the future of Islam. On the outskirts of Karbala, Hussein ibn Ali ibn Ali Talib (also called Haidar in chants by his followers) became a martyr of the faith and source of inspiration for Muslims worldwide. Each year, Shiite Muslims, a group in Islam that particularly elevates Hussein, marks the date of his martyrdom through a festival called Ashura. On the tenth day of the month of Muharram, Shiite Muslims gather for a visible remembrance of Hussein’s battle and martyrdom. Ashura is practiced differently around the world, but the main ceremony in every country revolves around men (and sometimes women) striking their chests and chanting, in some cases using sharp objects such as swords, razors, and chains to shed their own blood in sacrifice to Hussein. Nowhere is the ceremony more intensely visible than Nabatieh, Lebanon, a city tucked in the hillsides of the country’s scenic south. To the uninitiated, the doomsday music, actors on horses, and free-flowing blood feel like a movie-scene massacre. 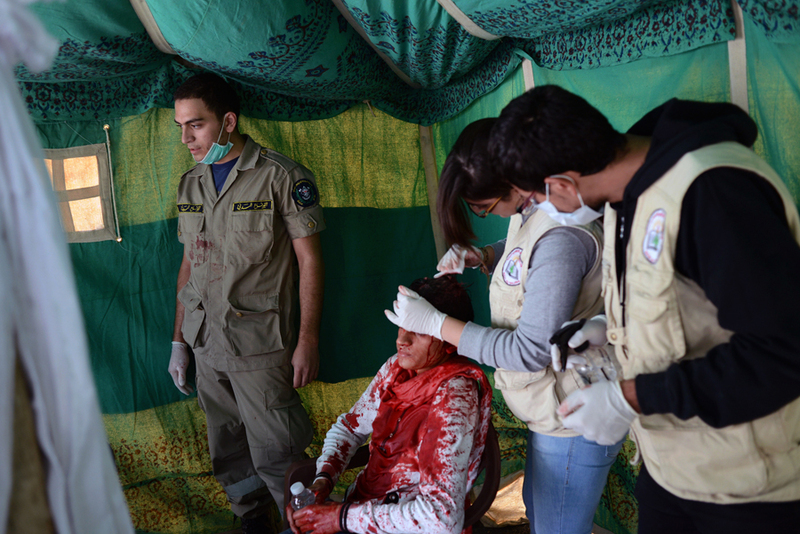 What begins with friendly men robed in white sheets ends with blood dripping down the steps of the “Hussainia” (community center) and unconscious youth passed out next to medical tents. The shedding of blood seems senseless. Yet, while part of the excess may be due to young men releasing pent-up energy and frustration, the mourning behind the ceremony is very real. 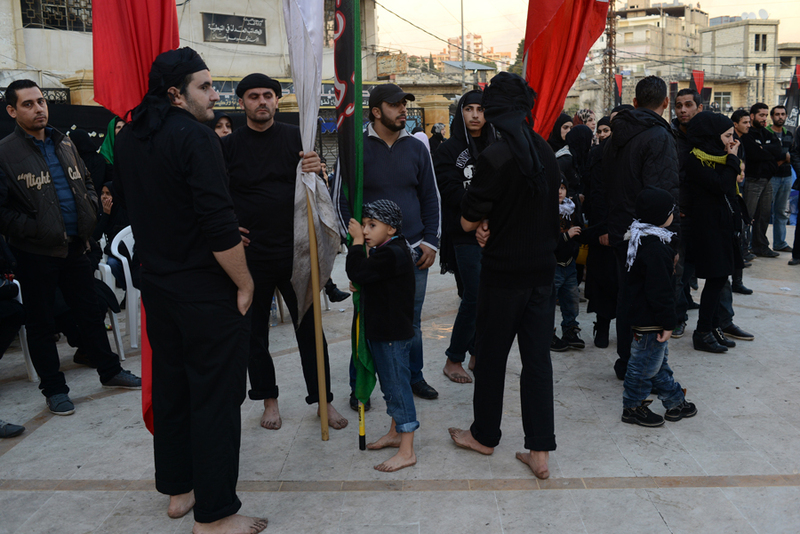 “A true Shiite should never stop mourning the death of Hussein,” one Ashura-practitioner said. Ashura is a true and tangible remembrance of a martyr of the faith. 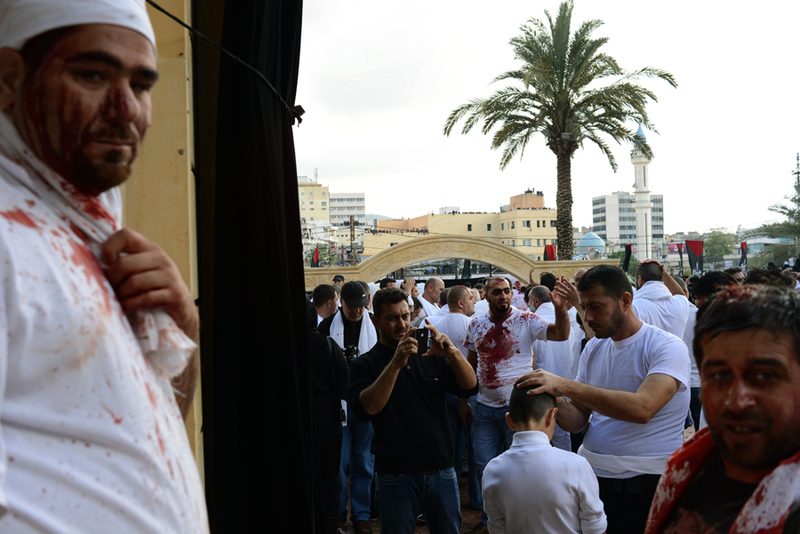 Every year in the town of Nabatieh, Muslims of the Shiite sect hold a day of fasting and flagellation in remembrance of the martyrdom of Hussein. 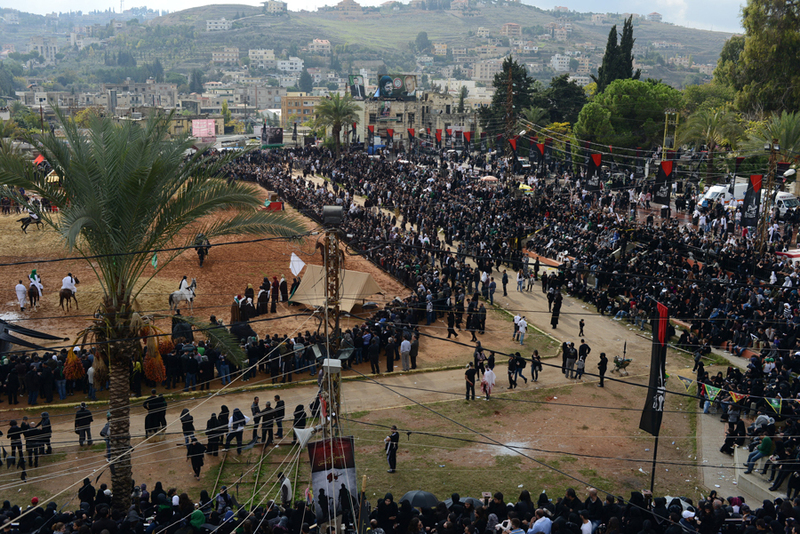 This small city in Lebanon’s hilly south draws thousands from around the Nabatieh Governate during the month of Muharram. 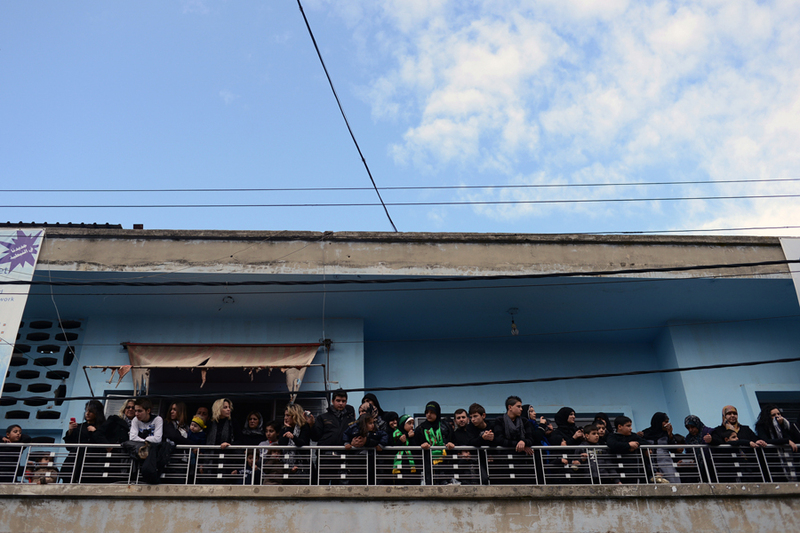 Residents of Nabatieh gather on porches and rooftops to watch the procession of actors marching through the streets, costumed in the robes of early Islam. One part of Ashura is reenacting the Battle of Karbala, an important event in the history of Islam in which Imam Hussein died for the faith of what would become the Shiite sect. 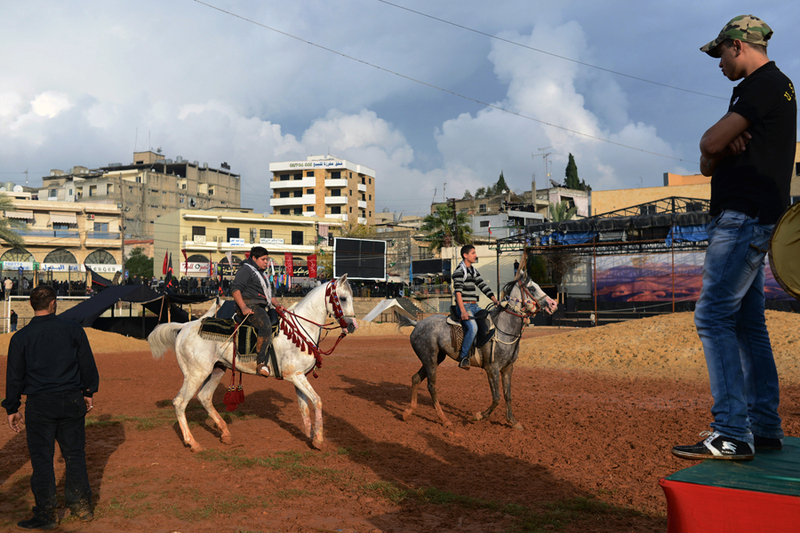 Lebanese boys ride horses around the sand arena built near the city center, which is used on the day of Ashura to reenact the Battle of Karbala. Hundreds of residents act out the historical events, playing the part of warriors, horsemen, or religious leaders. 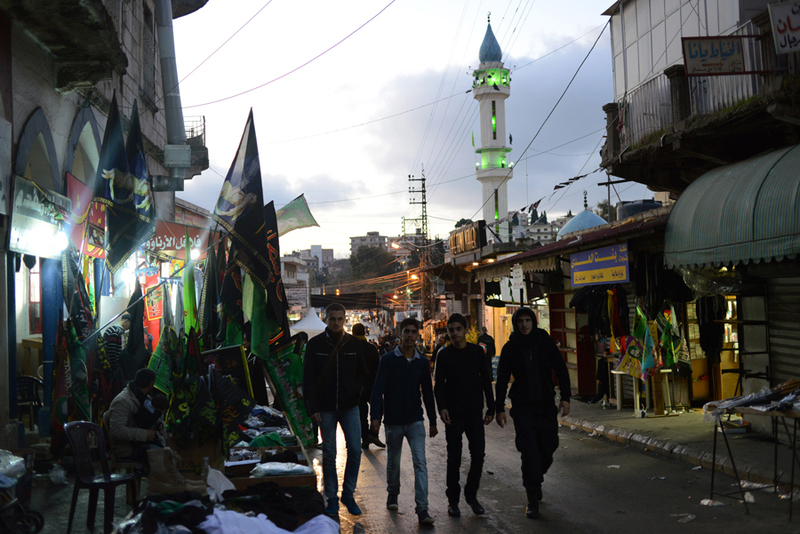 Young men walk through the streets of Nabatieh after prayers at dusk. The smell of argileh, street food, and fresh coffee fills the streets; Ashura is as much a community fair as a religious holiday. One distinctive difference between the Sunni and Shiite sects of Islam is their use of art. While strict Sunnis frown upon and sometimes forbid any personal representation in art, the Shiite use it frequently. Green flags and banners adorned with images of Hussein fill the tiny shops lining the streets in Nabatieh. The day of Ashura, entire families gather at the local Hussainia, a community center built for religious gatherings and remembrance of Hussein. Devotees commonly carry flags of green, red, or black, with Islamic proverbs or names of martyrs emblazoned on them. 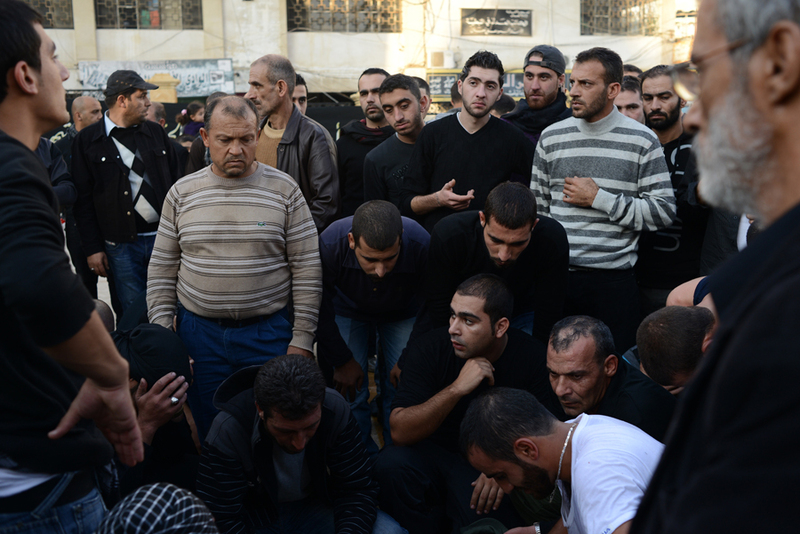 A few dozen men gathered early, around 8 a.m., at the Hussainia. Dressed mostly in black as a sign of mourning, they offered prayers of sorrow for the martyrs of Islam and supplication for protection in the future. Women are seen through a doorway of the Hussainia. 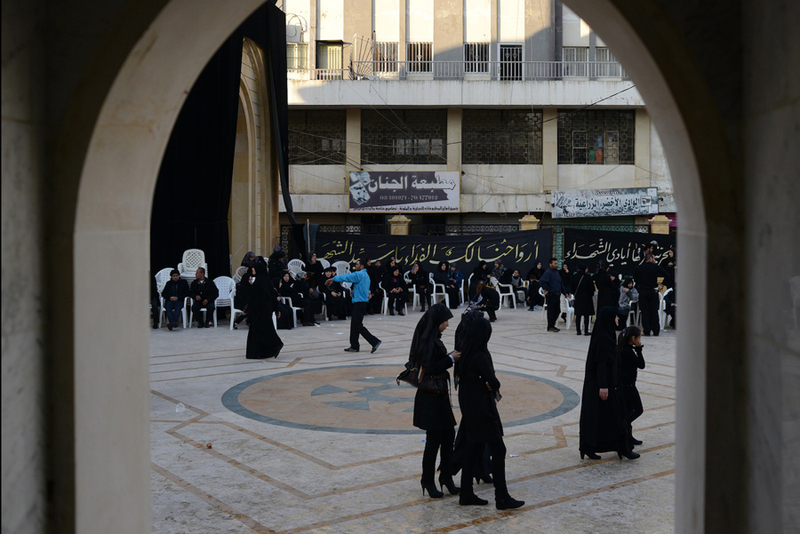 The most orthodox of Shiite wear black year-round, but on the day of Ashura before the procession starts, nearly everyone is adorned in black shirts, robes, and abayas. While most of the people who participate in the bloody self-flagellation part of Ashura are men, women are present, and some go to the same extreme. 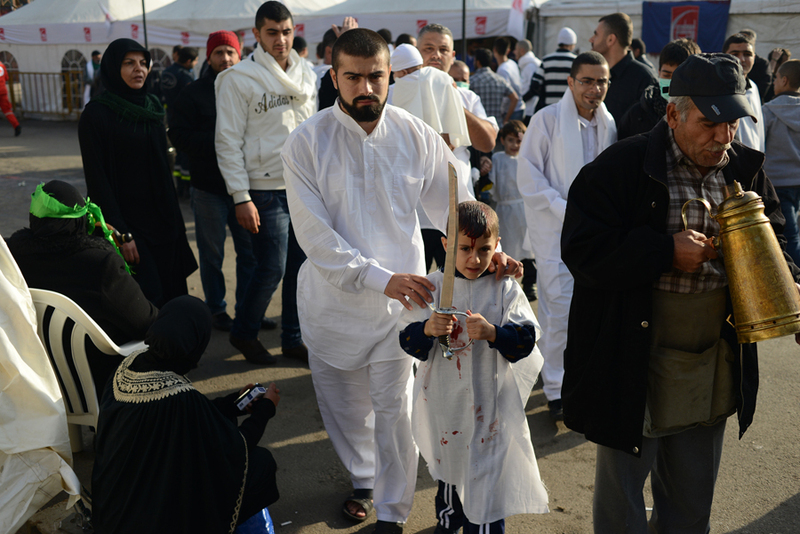 A father leads his son to join the Ashura procession after receiving his first cut. Specialized “cutters,” usually elders from the mosque, take a shaving razor and make a small cut on the top of practitioners’ heads. Old and young, men and women all participate. While the original practice was supposed to be symbolic, a tiny cut that produced little to no blood, the ritual has escalated into a very real shedding of blood. 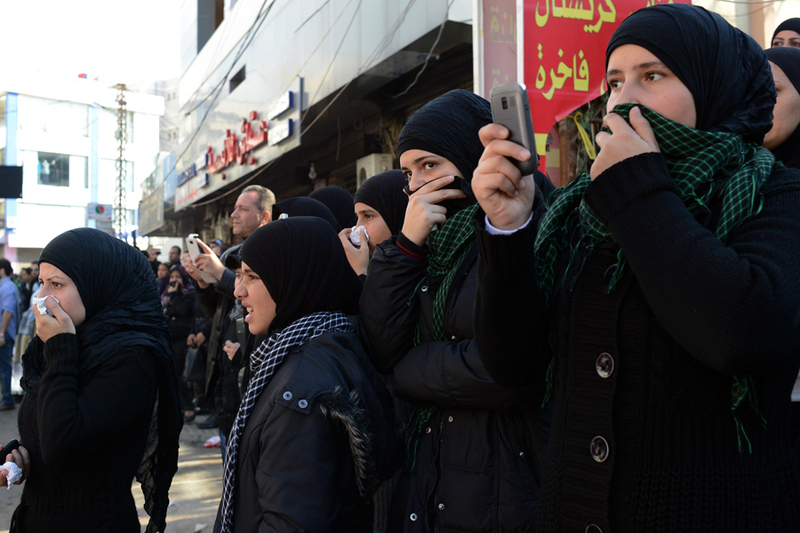 Men stand in the courtyard of the Hussainia, taking pictures of their family before marching into the streets. Not everyone takes the practice to such an extreme; some simply beat their chests in mourning, others take a small cut on their heads and leave it be. Yet all who wish to shed their blood make it as obvious as possible by donning white sheets over their clothing. 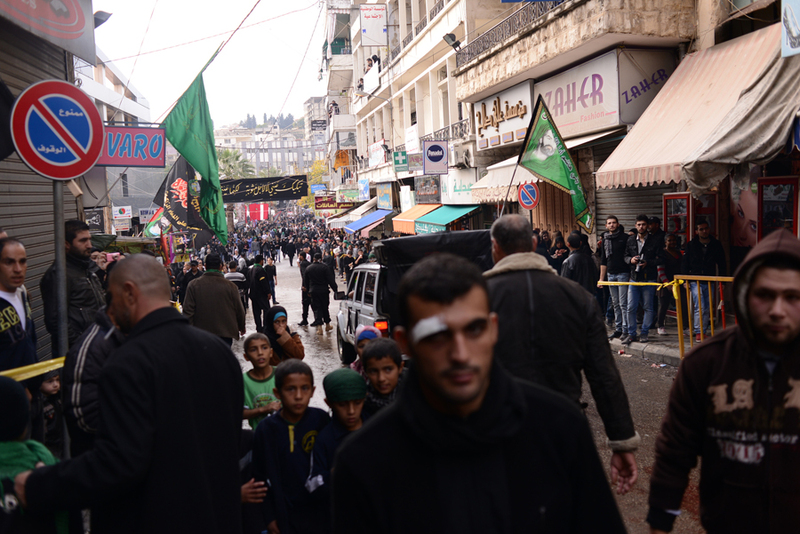 Bloody young men continue to cut their heads, chant, and march through the streets of Nabatieh. By and large, the most extreme participants are young men, strong and passionate 20- to 30-year-olds, yelling to the heavens their love for and willingness to sacrifice themselves on behalf of Islam. 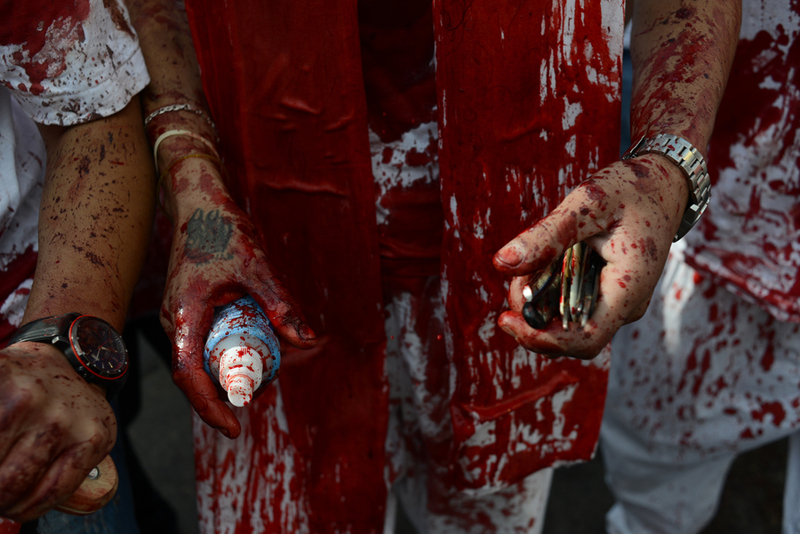 A Lebanese man carries razors and antiseptic during the Ashura procession. Nearly every person has their own razor, and many carry their own antiseptic to reduce the chance for infection. 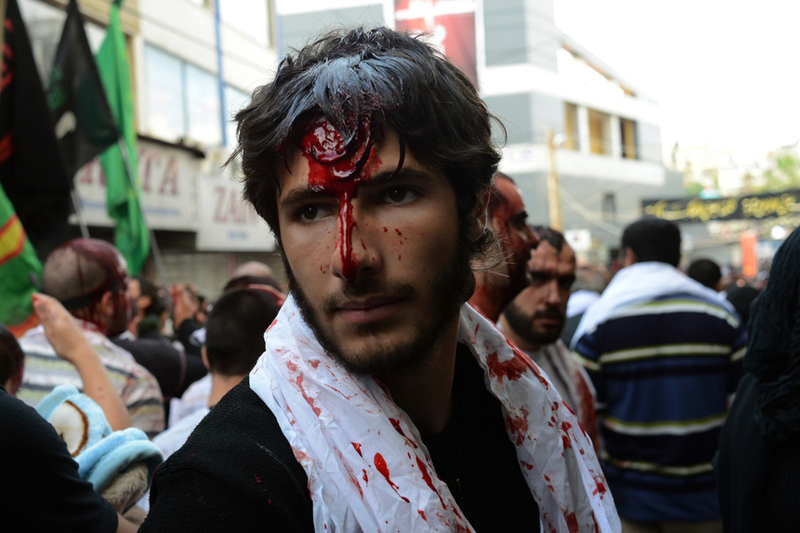 A Lebanese man makes his way through the streets with fresh blood dripping down his forehead. Lebanese people who chose not to participate look on at the procession. The smell of blood is overwhelming. Books and articles about war tell of the tangy smell, the coppery taste that works its way into the back of your throat, but the experience can’t quite be explained. The smell is sharp and powerful, and small sprays of red liquid flew though the air as practitioners continued to hit themselves. Blood is unavoidable. In the presence of such violence and blood, there must be medical attention at the ready. 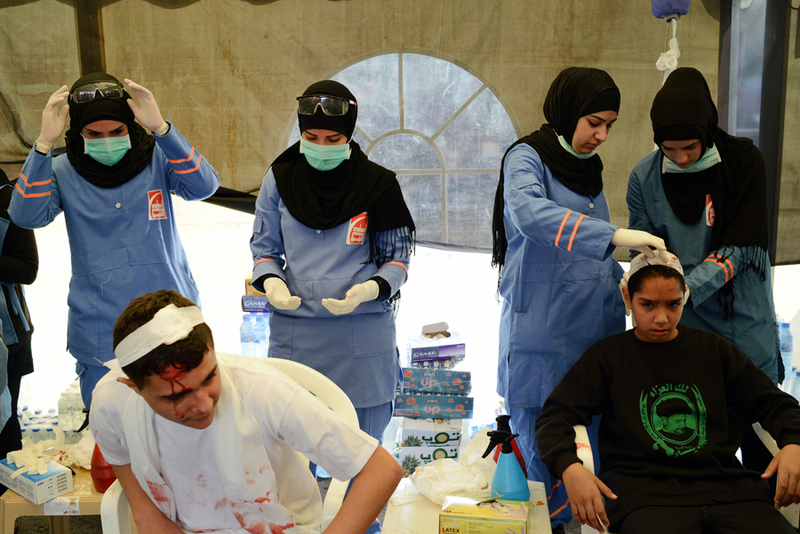 At least five medical tents are set up along the route of the Ashura procession, ready to provide care to anyone in too much pain, or to carry away and revive those who pass out. Nurses, medics, and volunteers are all on hand to provide care. Once the procession of civilians is over, many of the medical staff take to the streets themselves. 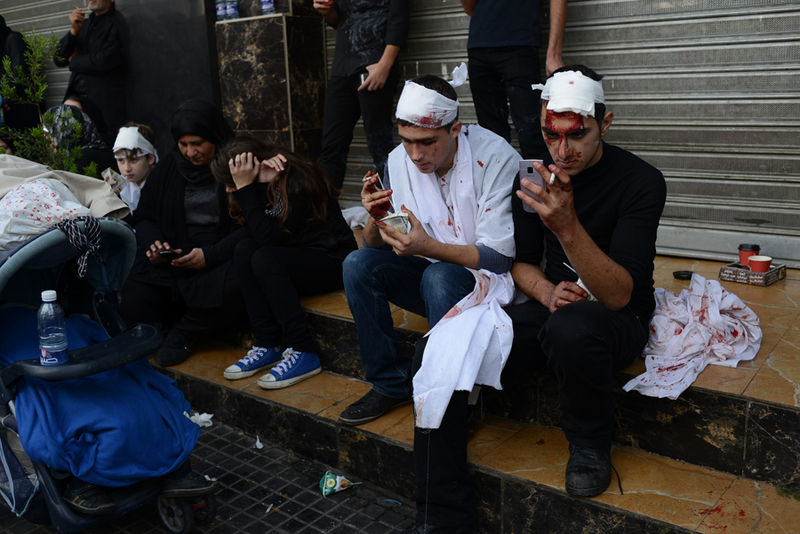 Young men smoke and talk on their cell phones after the Ashura procession. Of the thousands who self-flagellate, many participate moderately, going about the rest of their day normally. 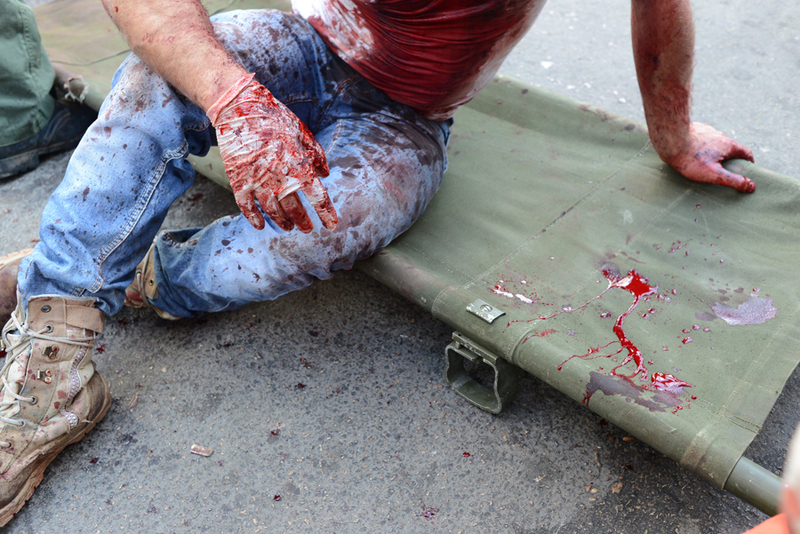 A man who had passed out in the street rests for a moment on a stretcher with his freshly shed blood at his side. The most common reason for medical treatment is shock caused by the rapid loss of blood. 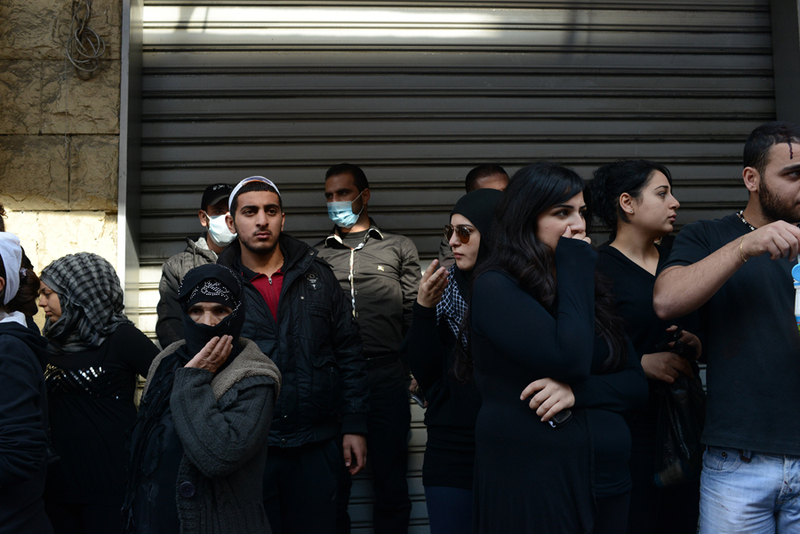 Lebanese girls cover their faces to mask the smell of blood wafting through the streets near the end of the procession. The green and black scarves around their necks are commonly worn by Shiites during Ashura: green is traditionally the representative color of Islam. Starting in early afternoon, thousands gather around the theater of sand near the center of the city. There, dozens of actors reenact the battle of Karbala, residents smoke argileh, eat snack food, and pray for blessings upon their year.